Oh, dude, Raj is f---ed. Indeed he is, Rengan. The Galleon founder and now convicted inside trader stands to serve 19 and a half years in prison for his crimes: nine counts of conspiracy to commit securities fraud and five counts of securities fraud. The unanimous verdict came back earlier today after 11 days of deliberation (and one juror change). The verdict was not a surpristing one, as many close observers of the trial believed Raj's defense team could not beat the mountain of evidence presented by the prosecution. 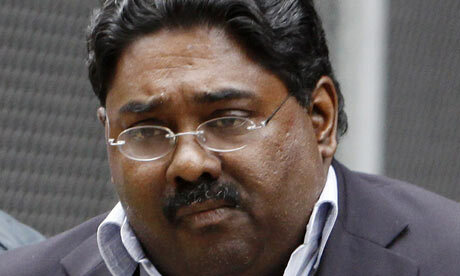 Particularly damning were the 45 wire-tapped phone conversations between Raj Raj and his co-conspirators (including his brother Rengan Rajaratnam), many of who have pleaded guilty to insider trading charges of their own. While he awaits sentencing in July, Raj Raj will not be behind bars, but he will be fitted with an electronic device to monitor his whereabouts. Presumably, he will not be making too many phone calls. Though a huge blow to Raj Raj and his defense team (which will be entering an appeal), the guilty verdict was a huge win for the SEC, which has come under fire for not convicting any men, women or children in the wake of the financial crisis. However, the Commission has done a pretty good job of nailing inside traders, and Raj Raj is by far their biggest catch yet. What Do Lloyd Blankfein, J.Lo and Elvis Have in Common? Who's the Highest Paid CEO on Wall Street?